For the Rosenblatt Recital at the Wigmore Hall on Thursday 6 November 2014, tenor Jorge de Leon performed a selection of songs by composers from Argentina, Cuba and the Canary Islands, and was then joined by mezzo-soprano Belen Elvira for opera arias and duets by Mascagni, Puccini, Torroba, Sorozabal, Cilea and Bizet. They were accompanied by Joan Antonio Alvarez Parejo. Jorge de Leon was a name new to me. He hails from the Canary Islands, as does the mezzo-soprano Belen Elvira. Leon revealed a very striking, and substantial spinto tenor voice and recent performances have included Cavaradossi (Tosca), Turiddo (Cavallaria Rusticana), Don Jose (Carmen) and Calaf (Turandot). He and Juan Antonio Alvares Parejo opened with a group of songs by Argentinian composers. Cancion del arbol del olvido by Alberto Ginastera (1916 - 1983) was a gentle habanera-like piece with a very folk-like melody. Pampamapa by Carlos Guastavino (1912 - 2000) felt very much like a popular song, given a highly effective arrangement by Guastavino. Another Guastavino song, Ya me voy a retirar was gently melancholy. Los pajaros perdidos by Astor Piazolla (1921 - 1992) combined imaginative touches in the piano with a tune which was very much an ear worm. In all these, Leon imbued what was often quite straightforward folk-inspired material with a depth of passion which came from his commitment and the thrilling vibrancy of his voice. His gentle singing was highly expressive, but when he opened up he really made the music throb with passion. Mirame asi by the Cuban composer Eduardo Sanchez de Fuentes (1874 - 1944) returned us to the habanera like form, with another infectious tune. Another Cuban composer, Rodrigo Prats (1909 - 1980) provided the lovely Soledad with its infectious rhythms and sense of melancholy. Finally in this half, a pair of songs from composers from Jorge de Leon's native Canary Islands. Al pie de la Cruz del Roque by Blas Sanchez (born 1935) was folk-like with a very haunting tune, though not especially complex. Tenerife by Braulio Antonio Garcia (born 1946) seemed very much like a Neapolitan song but with a Spanish accent, but the vibrancy and commitment of Jorge de Leon's performance made the piece very affecting. For the second half, Jorge de Leon was joined by the mezzo-soprano Belen Elvira. They opened with scenes five and seven from act one of Mascagni's Cavalleria Rusticana. Elvira proved to have a rich, deep and vibrant mezzo-soprano voice, though occasionally it seemed a to lose focus and be too vibrato laden, but the results were highly impressive. She and Leon made a very dramatic and thrilling duo in this torrid scene between Santuzza and Turiddu. In many ways, this was not an obvious excerpt to take from the opera and rather more akin to a bleeding chunk. This was emphasised by the slightly schematic dramatics used by the singers, which gave the performance a rather old-fashioned air. But there were old fashioned virtues too, particularly in Leon's flexible but thrilling spinto tones, wonderfully even over the whole range and the vibrancy of Elvira's performance. Leon followed this E lucevan le stelle from Puccini's Tosca which he sang with impassioned, Italianate open spinto tone and a nice flexible sense of line. Elvira returned to join Leon for a duet from Luisa Fernanda, a zarzuela by Federico Moreno Torroba (1891 - 1982). It was far less popular in style than I naively expected from a zarzuela, which is a form rather more complex than we often give it credit for. Torroba had written a fascinatingly flexible and rather melancholy duet which followed the shape of the text. Here it was finely sung by Leon and Elvira, with a moving conclusion. Leon then sang a tenor solo from another zarzuela; No puede ser from La taberna del puerto by Pablo Sorozabal (1897 - 1988). This was an almost verismo-esque piece which Leon gave a vibrant finish. Elvira then sang the Princesse de Boullion's act two solo from Adriana Lecouvreur by Francesco Cilea (1866 - 1950). Acerba volutta seemed ideally suited to the old-fashioned drama of Elvira's singing and it was clear that she would make a powerful, thrilling and dramatic Princesse de Bouillon. The evening concluded with another duo, this time the closing scene from Bizet's Carmen. Again Leon and Elvira had chosen to give us a highly dramatic scene rather than a more conventional operatic excerpt such as the Flower Song (though I would very much love to hear Leon performing this). Elvira's Carmen was perhaps a bit stately and a bit grand, but then Leon's Don Jose was a little stiff and both would have benefited from work with a good director. But musically this was superb stuff, again I come back to rather old-fashioned virtues. Doing the final scene from Carmen was in many ways a daring choice, but the performers brought it off thanks to their fine singing. Here we had thrilling voices used intelligently with some musical and dramatic singing. Throughout the evening, the singers were supported and accompanied by Juan Antonio Alvarez Parejo who moved between the various styles, folk-inspired, popular song, zarzuela and verismo opera, with ease. 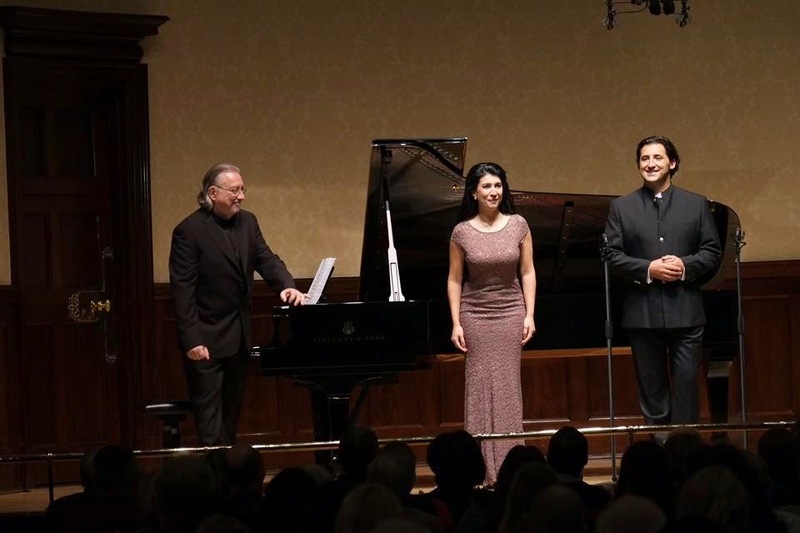 The Rosenblatt Recitals continue on December 3, 2014 at the Wigmore Hall with a recital from the Russian lyric soprano Aida Garifullina, winner of the Operalia competition in 2013.